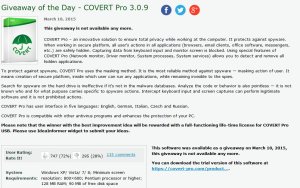 This March popular website Giveaway of the Day (often abbreviated GOTD) http://www.giveawayoftheday.com/ offered to its visitors install and test COVERT Pro. According GOTD, the program has been downloaded 23,405 times in 24 hours. 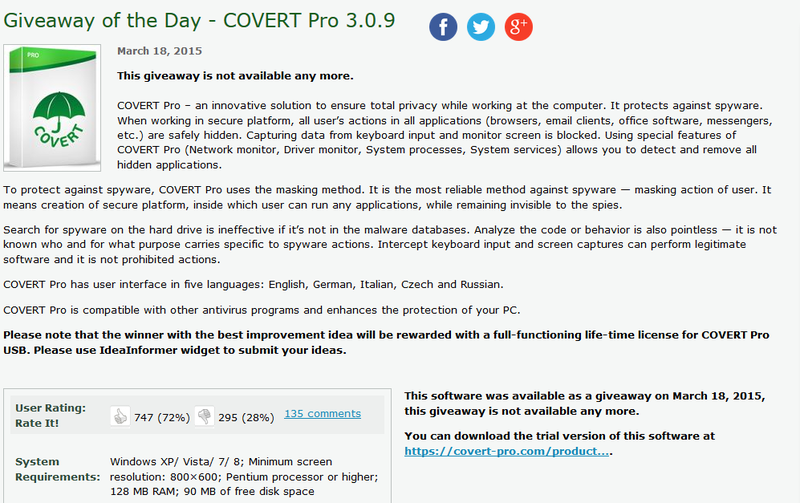 About 72% of visitors liked Covert Pro. According to this index, COVERT Pro has long been ranked first on this popular resource. •	Have to applaud the developers for trying a different approach to computer protection, something has to be done as far too many critical systems are open for abuse. •	I’ve been using GAOTD for a long time and wanted to say how much I appreciate this site and the software it provides. Today’s interaction between the software creator and our comments has been really great. I am surprised that so many other software creators do not reply to our comments. •	I would like to thank CovertPro for the give-away, and more importantly their assistance in these comments, without which I may not have downloaded the program.